Cooking adventures with the boyfriend has continued! However, this time it’s even simpler and it’s Spam Musubi. Spam is something people get rather iffy about because it’s a luncheon meat in a can. However, it can be a tasty treat once in a while. 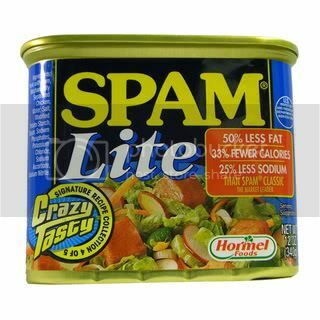 I highly recommend getting at least Spam LITE because the fat and sodium content is less (I like it tasting less salty anyways). Even if you don’t like Spam, at least try Spam Musubi once. There is just something about it that makes it taste better than eating plain old Spam. If you don’t know already, Spam Musubi originated in Hawaii and it is based on Japanese Onigiri (type of rice ball). They are meant to be very portable and easy to eat. Traditionally, I think you would just use unflavored rice, but for me personally, “sushi rice” is the only way to eat Spam Musubi! It gives the whole thing so much more flavor and savory-ness. It’s an extra step, but to be honest there aren’t too many steps in making Spam Musubi in the first place. Writing this out has probably been more effortful than actually making it was! How do you make Spam Musubi? Make your rice. I prefer Japanese rice, which is short-grained rice and perfect for making these types of things because they are very sticky when cooked so that nothing will fall apart. We have a rice cooker on hand, so that makes things very easy. We used 3 cups of rice and maybe a little less than 3 cups of water. (General rule is to have the water line about 3/4 of an inch higher than the rice.) The great thing about having a rice cooker is you just leave it for about 20 minutes while you go about your business cooking something else. Fry your Spam. You don’t have to since it’s already cooked, but as you may know, uncooked Spam is very yucky looking and mushy. Fry it with a bit of oil to give it a crisp. You only need to use a bit of oil because Spam already has so much fat in it. You might be able to use none if you have a non-stick pan. You can also fry the spam with soy sauce and sugar according to your taste. Now for the seaweed. 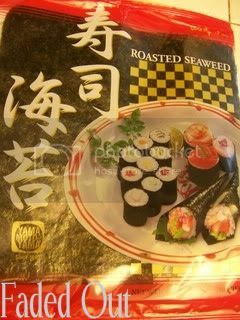 Use roasted seaweed, it is a little bit crispy, but will turn soft once it touches the rice. You should have a large, square-shaped pack of seaweed. 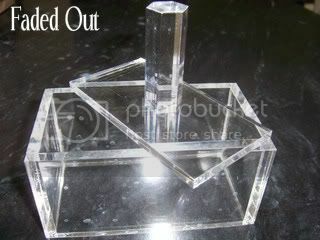 Cut the pieces lengthwise to fit the Spam and Spam Musubi Mold (explained later below). If your seaweed is perfectly shaped like mine was, I just needed to cut it in half to make two rectangles to roll the Spam in. 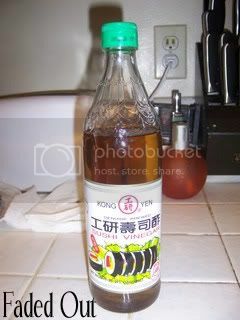 To make the “sushi rice” all you have to do is put the freshly made rice in some type of flat pan or baking dish, sprinkle in about 1/3 cup of rice vinegar over it. Quickly fold and mix the rice gently with a spoon and fan it with a piece of paper to cool it and give it a nice, shiny look. 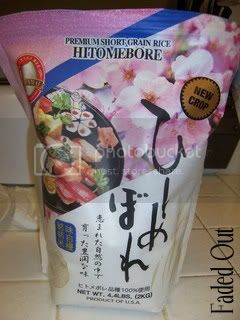 For the finishing touches on the rice, you can sprinkle in furikake, which will also give the rice more flavor. Mine had seasoned dried bonito flakes and eggs. 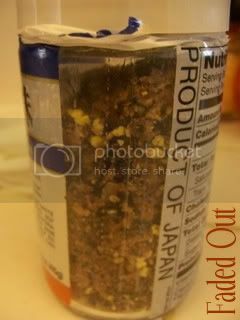 There are many different flavors of furikake sprinkles. Some have just seaweed, etc. The Spam Musubi mold is AMAZING. I am probably more excited than the normal person, but I’ve always wanted one. It’s one of those things that are not necessarily essential, but having it makes things so much easier and knowing you have it just makes you happy. (…I’m NOT weird… ) For a while I only saw this for sale online for outrageous prices, but recently we found this at our local Japanese supermarket for 4 bucks. Anyway, this mold is spaced over your strip of seaweed that you just cut. One layer of rice is packed in, and then pounded with the top that you see. One slice of Spam is put in and another layer of rice is pounded on top. 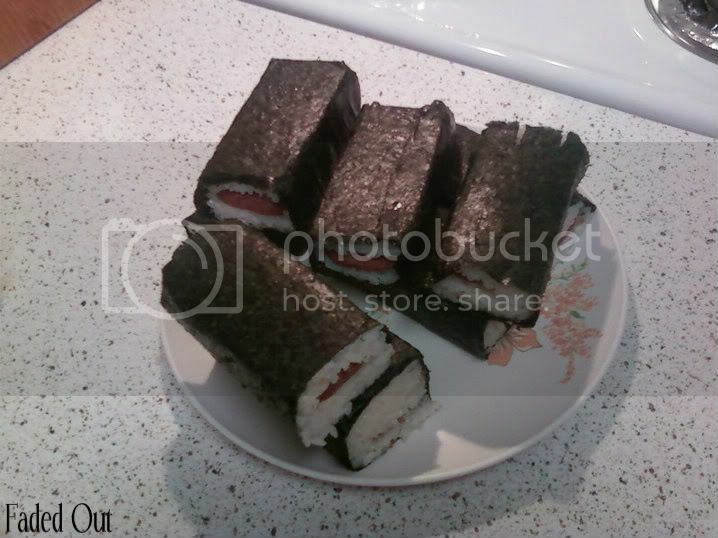 Once it is all nicely packed, remove the mold and roll up your musubi with the rest of the seaweed! To tuck in the last hanging piece of seaweed, just take your finger and dab on some water onto the hanging piece and fold it over. This will make the seaweed stick to itself. An important tip is to wet the Spam Musubi mold after each one that you make. The rice will be very sticky, so it will stick to the mold making it very difficult for you unless you wet it first! A very simple process, but also a really tasty treat! This is the perfect food to take with you on a car trip or to a picnic.